High Brew Coffee is a portable, shelf stable, ready-to-drink coffee that comes in delicious flavors such as Mexican Vanilla, Double Espresso and Black and Bold. At only 60 calories per can or less, High Brew provides the perfect caffeine boost during the busy and hectic holiday season. They never apply heat, but use filtered, ambient temperature water instead to brew their coffee. Cold-brew coffee has a smoother, bolder, less acidic and bitter flavor due to the absence of heat in brewing process. High Brew cold-brew coffee contains a higher amount of caffeine due to an optimal coffee bean, grind, ratio of coffee to water and brewing process. 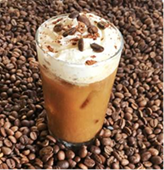 Cold-brew is not to be confused with iced coffee, which is hot brewed coffee that has been poured over ice. The Salted Caramel Martini will give your holiday guests an indulgent, boozy treat with a jolt of energy. You can purchase High Brew Coffee at your local retailer.